PennDOT has been doing extensive construction on I-376 between Robinson Township and PIT. This went up the other week along with another one at MM 57. Is there a us 376? No, but use Google first next time. 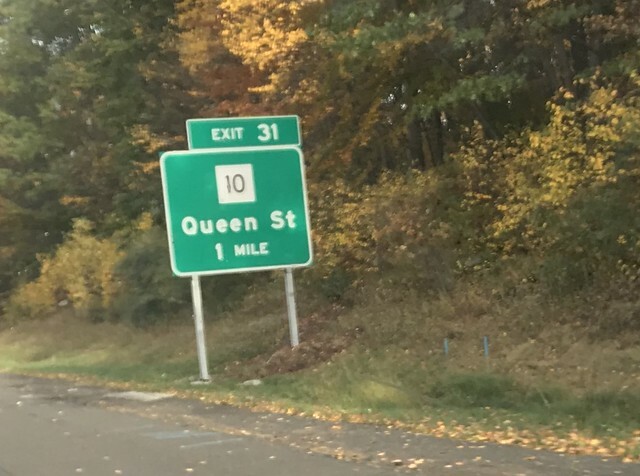 I've driven by this sign more times than I can count, but only now did I bother to get a photo. I think this fits "erroneous" because the design is correct, but it supplies incorrect information. The "no right turn" sign (bottom of photo) should be a "no left turn" sign. 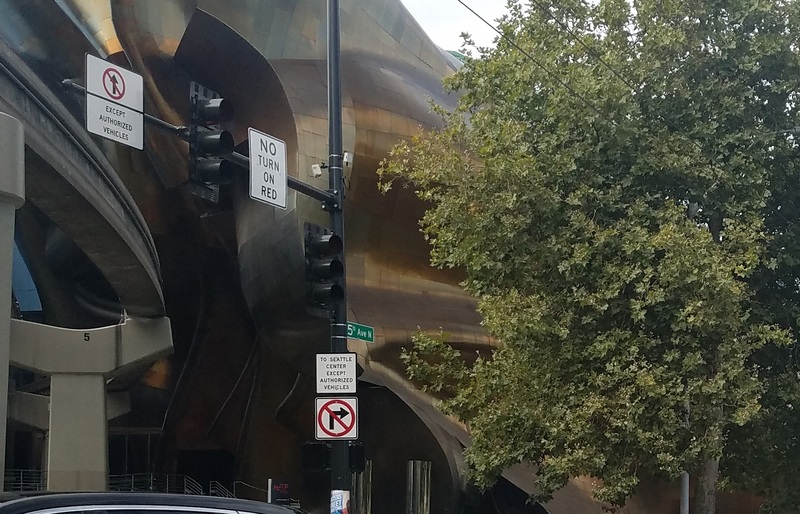 On the left is an authorized-only entrance to Seattle Center. Notice the "no straight" sign on the mast-arm. Turning right here is very legal and normal (leading to a typical city street). It's possible that the sign was meant to face traffic continuing south along 5 Ave N, but it's not facing the right way. GSV: https://goo.gl/uHdkqY (sign not yet installed, FYI). This sign error is probably the most obvious to an Ontarian, but this blue sign for Halls Road is an anomaly. Signs like this should be green, however this sign was erected as part of the work that saw the neighbouring Hwy 412 interchange constructed, which as a toll road should and does have blue road signage. 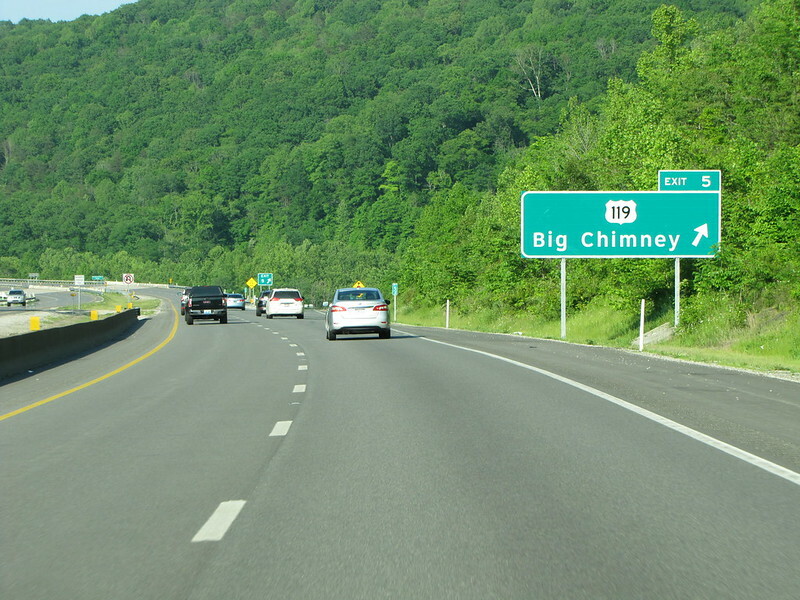 During a sign installation project a couple of years ago, West Virginia's contractor installed the wrong route markers on all the new signs for Exit 5 on I-79. 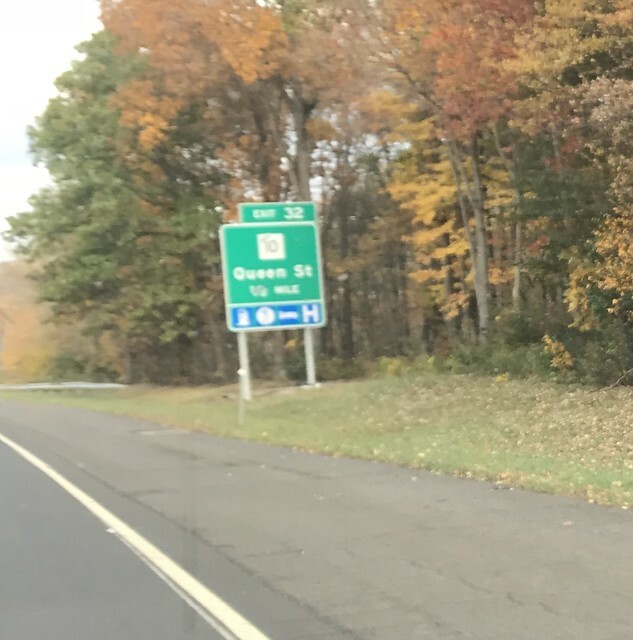 The exit is actually for WV 114, but the new signage indicates US 119, which WV 114 intersects a few miles south of this interchange. This is how the signage originally appeared. 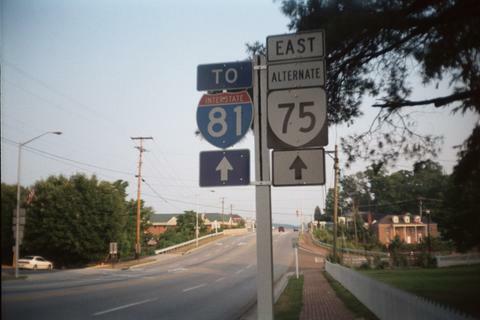 It should be noted that the first picture is southbound and the second one is northbound, but both directions now read US 119 instead of WV 114. Well, easily fixed by slapping the word "TO" on the BGS signs, right? 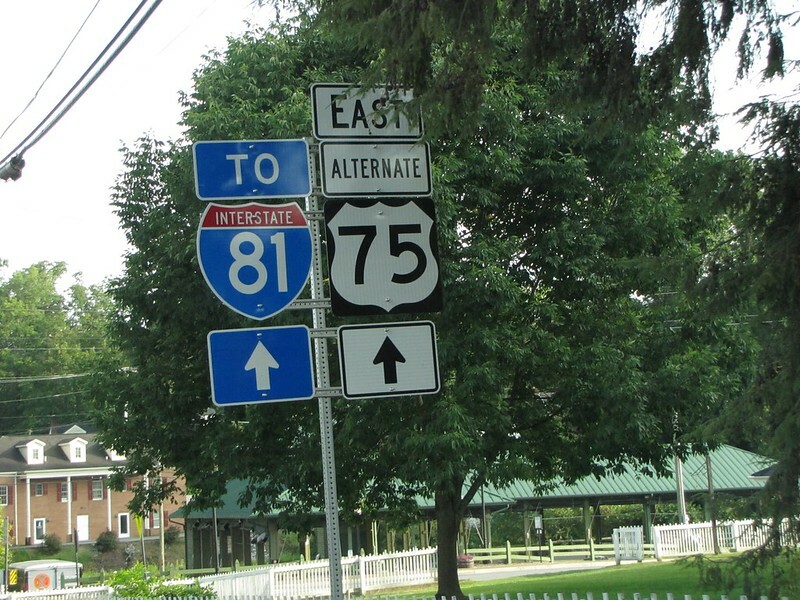 The WV 114 shield is optional, as long as there's also "TO US 119 --->" signs at the ends of the ramps. 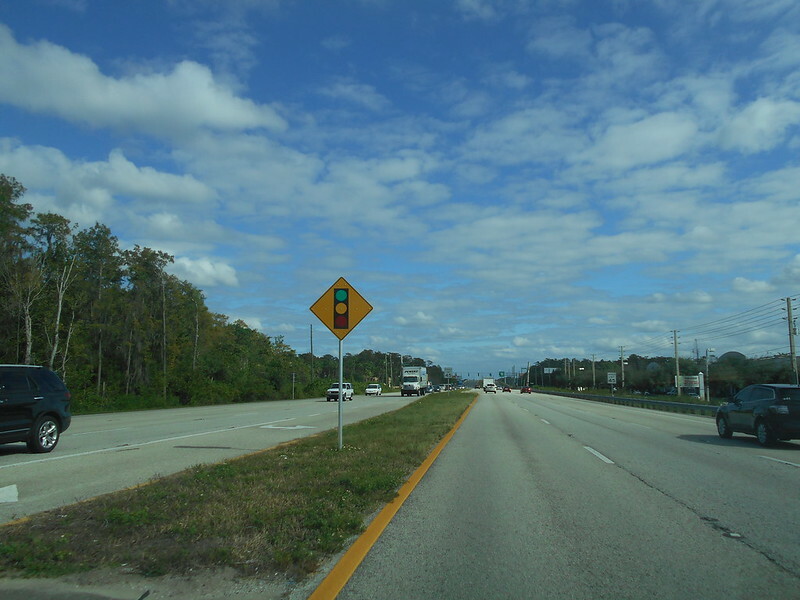 There always were "To US 119" signs at the ends of the ramps. They, too, were replaced in the project. And there are WV 114 signs at the bottoms of the ramps. Definitely erroneous, but only the installation is. The sign is correct, but the installer was not paying attention. This one's a double error. It says US 75 when it should be VA 75, and in reality the marker here should be US 58 (the road is a concurrency of Alternate US 58 and VA 75). Only error free if posted alongside a railroad mainline that is CTC controlled. I have more than one photo of that old assembly myself. Tipperary Hill in Syracuse. I'm stunned that the signal still remains green-over-red. You'd think the source of the trouble (Irish youth) had since moved on. I don't think kids throw stones at traffic lights anymore. Calvin: "I wonder where we go when we die." Calvin: "You mean if we're good or if we're bad?" 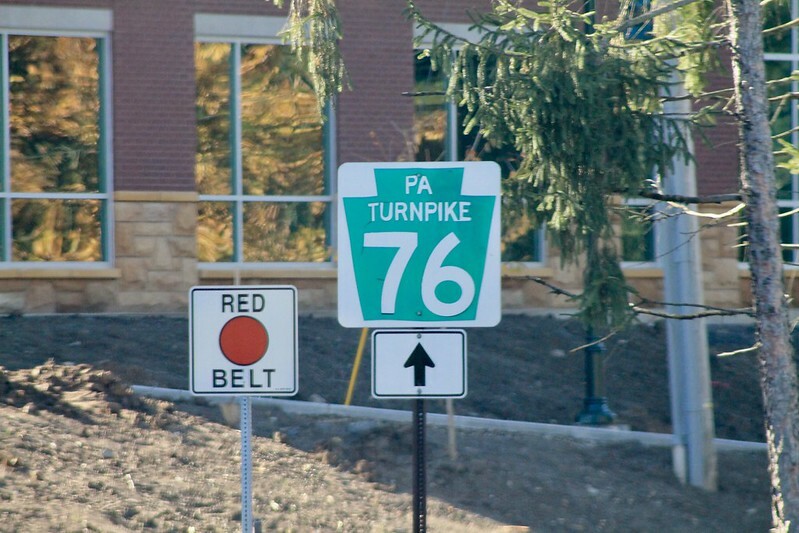 It's highway 76, and it's the Pennsylvania Turnpike. What does that red belt sign mean? It's a system in the Pittsburgh area for navigational purposes. 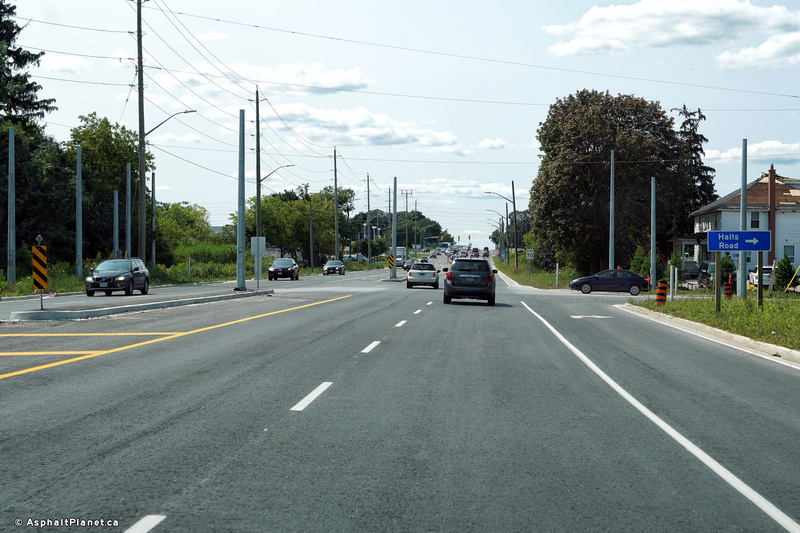 It essentially helps people get around the county by use of surface streets. Cool, but I would give the belts numbers. Probably couldn't use numbers as these are not state highways. I don't know if PA recognizes numbered county roads. While a "County" belt system, the routes utilize all sorts of roads. They're routed on some state roads, some county roads, and some municipal roads. I'm pretty sure, but not totally sure, that only the county maintains the signs for them. 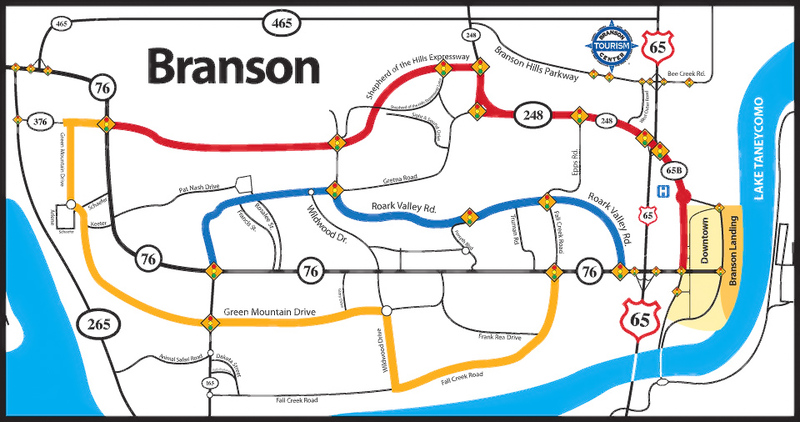 Branson (MO) also has a system of colored routes that are intended to be a network of alternate routes to the always-clogged Strip. They are shown prominently on tourist maps and signed in the field like this. Back when I first met my wife in 2003 or so, you could still kind of get around Branson by using side streets. By now, though, even the tourists have learned the side streets. This was brought up in another thread, but the concept of “county roads” is almost foreign in Pennsylvania. In many counties, the only county-owned roadways are essentially driveways or access roads on county-owned facilities (county parks, county-owned reservoirs, county prisons, etc.). Allegheny is one of the few counties (perhaps the only one) to have any general purpose streets/roads under county ownership and maintenance. I think the use of colors is appropriate since the belts traverse a patchwork of state and local roads, some of which are already numbered. I have to wonder how much the colored belt system is actually being utilized, though. I remember seeing one AAA city map for Pittsburgh that had the colored belts highlighted (and explained), but I imagine that most out-of-towners have no idea what the colored belts are and don’t use them. And I assume locals wouldn’t need them for the most part.